The best thing about New Year’s Eve – besides drunkenly slamming the door on the end of a less-than-fun 2016 – is being able to rock the shimmering, glittering out-there party dresses of your dreams. But until you’ve got a plan fully in place, with tickets bought and a taxi booked, figuring out what to wear as you ring in the bells is impossible. Is it a chilled hangout at a friend’s house, a formalwear event, a night on the town, a pub crawl? Unless you and your friends finalised the evening’s itinerary months ago, you have no way of knowing what kind of outfit you need to pull together. To save you suffering a last-minute what-to-wear panic, we’ve scoured the internet and picked five ball gowns and fashion staples to see you through the night – no matter what kind of party you end up going to. For most of us, ball gowns are the stuff of fantastical daydreams. We watch celebs swanning around in them, but we rarely get a chance to wear one ourselves – except for a formal New Year’s Eve, of course. And in this black 2 in 1 maxi dress, with a delicate lace applique body and flowing chiffon skirt, you’re sure to have your very own princess red-carpet moment. Its elegant, simple silhouette and shape is a total style winner. Although you don’t need to go for all-out glamour if you’re spending the night at a family party, you also don’t want to give your fussy auntie anything to moan about with your appearance. Wear this wine-coloured shift dress and she’ll only be full of compliments. The cut-out choker nails the 90s trend – and eliminates the need for jewellery – whilst the swing cut begs to be worn with a pair of this season’s knee high boots. Popping from one pub to another is a great way of spending the night – as soon as one place gets boring or too busy, you can just move on to the next. Make sure you’re wrapped up warm and safe from the chill with this tie waist coat. Its fur collar and flattering fit will keep everyone so distracted they won’t even notice whatever outfit you’ve thrown on underneath. If you’re dancing in the New Year at a nightclub, then you need a showstopper of an outfit to steal the show – and that’s exactly what you get with this one-sleeved red dress. Pair it with a statement necklace and simple stilettos to really let it shine, and remember to prep skin and apply fixer to make sure your makeup survives the lights and heat of the dancefloor. Sometimes nothing beats an evening in chilling at your friend’s, especially on New Year’s Eve after a busy few weeks of festive parties. But that doesn’t mean you can’t treat yourself to a new outfit – you just get it keep it casual and relaxed. 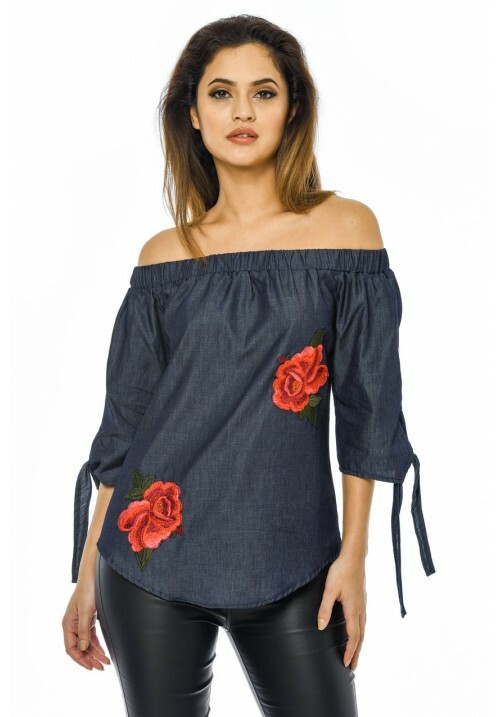 This embroidered denim top is not only bang on trend, it’ll also let you stay comfy all night long.